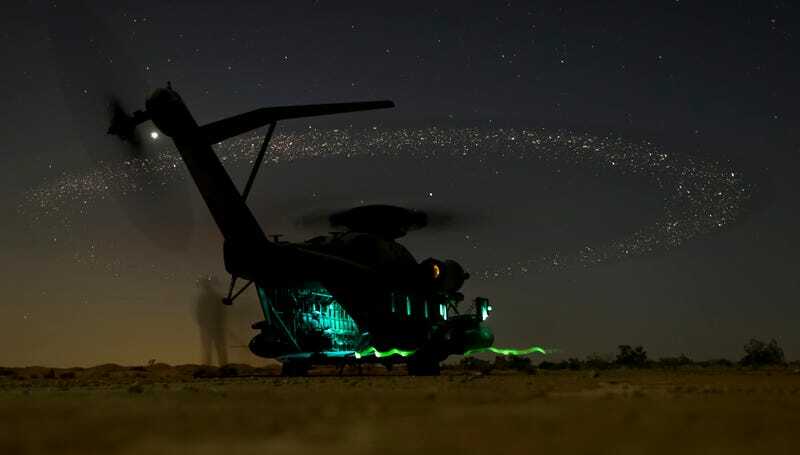 Here's a really neat photo that shows a US Marines CH-53E helicopter during a training exercise at night that makes it look like the blades of the military chopper have been replaced with star-powered flight. It's like a helicopter of the cosmos that has the ability to create portals into another universe. U.S. Marines assigned to Marine Aviation Weapons and Tactics Squadron One (MAWTS-1) break down a rapid ground refueling during the Weapons and Tactics Instructor Course (WTI) near 29 Palms, Calif., March 27, 2015. WTI is a seven week event hosted by MAWTS-1 cadre. MAWTS-1 provides standardized tactical training and certification of unit instructor qualifications to support Marine Aviation Training and Readiness and assists in developing and employing aviation weapons and tactics. The photo was taken by Sgt. Daniel D. Kujanpaa.